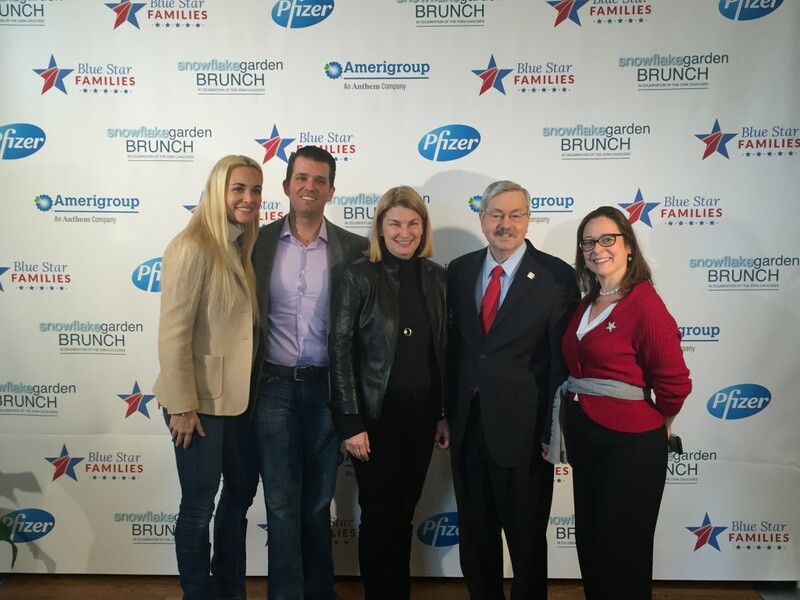 One day prior to the 2016 Iowa Caucuses, politicians, media, and campaign activists gathered at the Iowa Caucus Snowflake Garden Brunch (#SnowflakeGardenBrunch) to honor the work of Blue Star Families. Hosted by Tammy Haddad, Hilary Rosen, Mark Halperin, John Heilemann, Ben Ginsberg, and John & Christine Stineman in Des Moines at the World Food Prize Hall of Laureates, Iowa political leaders who attended the brunch included Governor Terry Branstad and U.S. Senator Charles Grassley, Iowa Republican Party Chair Jeff Kaufmann, Iowa Democratic Party Chair Andy Maguire, Iowa Attorney General Tom Miller, and Iowa State Auditor Mary Mosiman. CEO Kathy Roth-Douquet was presented with an award for her work on behalf of military families. Other Iowa leaders on hand included World Food Prize CEO Ambassador Kenneth Quinn, Ambassador Mary Kramer, former Iowa Republican Party Chair Matt Strawn, Jeff Link, Des Moines Register Publisher David Chivers, Des Moines Register Editor Amalie Nash, and Ann Selzer, Des Moines Register and Bloomberg Politics Pollster. Guests included actor Richard Dreyfuss, pollster Frank Luntz, Greta Van Susteren and her husband John Coale, Megan Murphy and Craig Gordon of the Bloomberg DC Bureau, Jonathan Martin of the New York Times, Betsy Fischer Martin of More Magazine, Washington Post’s Ruth Marcus, Becca Ginsberg from Google, CNN contributors John Avalon and Margaret Hoover, Pfizer’s Sally Susman, Campbell Spencer, Bush campaign strategist David Kochel, and Human Rights Campaign’s JoDee Winterhoff. Zignal Labs kept guests up-to-the minute with their Command Center in the lobby providing a real-time look at the presidential election through their multi-screen displays. Blue Star Families is a 501c3 formed by a group of military spouses to create a platform where military family members can join civilian communities and leaders to address the challenges of military life. Event sponsors were Amerigroup, Pfizer, Facebook and Mittera.